The strengthening of the nation’s economy means lots of things – like increases in prices. One unique metric that affects the nonprofit sector is the value of its volunteer workforce. According to Independent Sector (IS), the national dollar value of volunteer time in 2015 was $23.56 per hour, a 49-cent-per-hour increase from 2104. The hourly value of a volunteer’s time varies across the country. The value of volunteer time is based on the hourly earnings (approximated from yearly values) of all production and non-supervisory workers on private non-farm payrolls average (based on yearly earnings provided by the Bureau of Labor Statistics) for the national average. IS indexes this figure to determine state values and increases it by 12 percent to estimate for fringe benefits. Even though the value of volunteer work is up – at least using the IS metric – it appears the rate of volunteerism across the country is unstable. Josh Veal has more information. 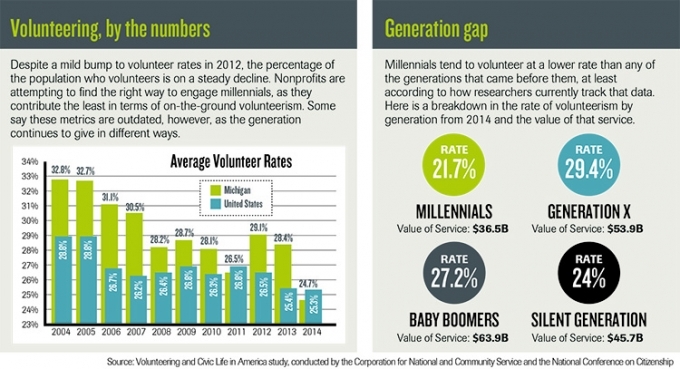 “Volunteering and Civic Life in America research showed that 21.7 percent of millennials volunteered in 2014 nationwide, compared to 29.4 percent of Generation Xers and 27.2 percent of baby boomers. Some believe these lower rates are merely a generation shift as Millennials “test” the volunteer waters to determine where they want to donate their time. Studies continue to indicate that younger workers have a stronger desire for social good than their older peers. But it seems clear that nonprofits will have to continue to work hard to maintain and grow their volunteer networks for the future.